This Sunday I was at a Methodist Church and the service had the same scriptures as last Tuesdays College Communion service; Matthew 3:1-12 & Isaiah 11:1-10, but the sermon was not based on the texts but rather was a rather dry piece of teaching on the Bible; why we should use the Authorised Version and how we should interpret it. The Preacher showed his age in that there are more contemporary translations and ways of accessing the scriptures which he failed to mention or dismissed without a thought and I might contend with some of his assertions. However the sermon wasn’t entirely without merit but it took a while before an image began to shape in my mind. I started with the Bible, half book, half scroll (Old Testament and New Testament),which rests upon the earth, the dove, symbolising the Holy Spirit hovers over it. A tree grows up from the centre of the book (The root of Jesse = Jesus). 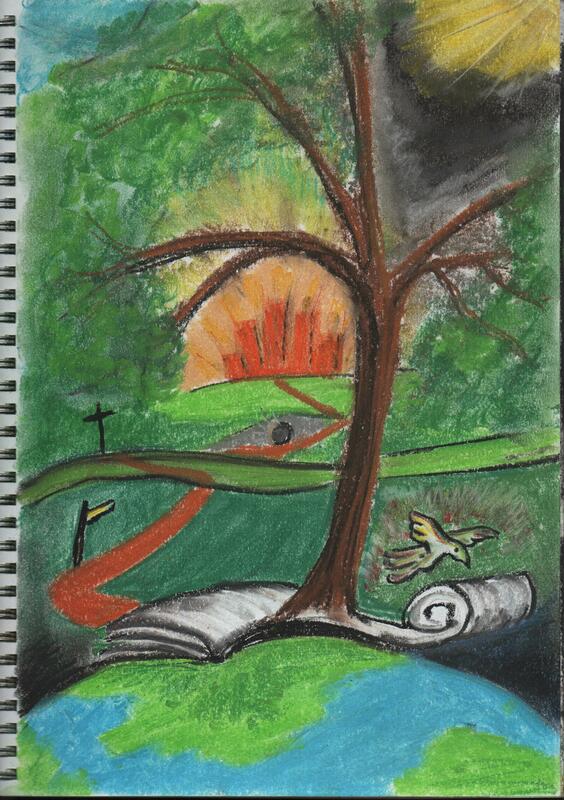 There is a path that leads away from the book and on the route is a signpost (John the Baptist) pointing the way. The path visits the Cross, the tomb and finally the Eternal City. The glory breaking through the clouds on the top right is God the Father (creator). wow, I wonder what Stan would say….